I absolutely LOVE my Kitchenaid. I don't know what I would do without it. The problem is that they are SO expensive! But, every once in a while you can find them for real cheap at Goodwill or at Yard Sales. They are usually really ugly though. 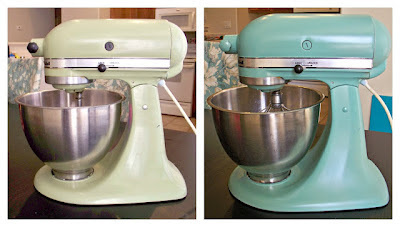 The Crafty Woman shows a way how to update your Kitchenaid for SUPER cheap. I thought it was a great idea! 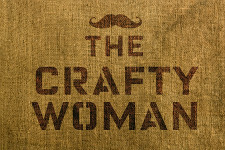 If you have not been over to The Crafty Woman, you definitely need to! She has SO many budget friendly and great ideas! A few weeks ago, Brittany and I were at Wal-Mart together and saw a recipe for Spinach Dip on a Knorr Vegetable recipe mix. We knew that we had to try it. And it was amazing! We served it at a little party and people kept saying that it was the best Spinach Dip that they have ever tried! 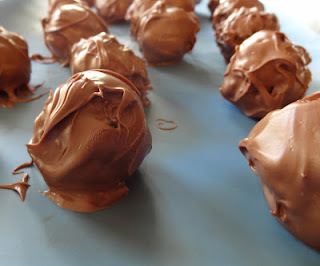 So here is the recipe and you will not be disappointed! Combine all ingredients and chill for about 2 hours. Serve. Oh, do we have a special treat for you today! 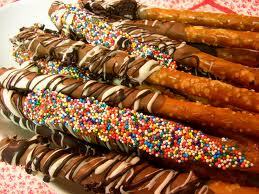 Cindy from Sweet Servings is giving away to one of our readers a dozen chocolate dipped sprinkled pretzels! She is the owner of Sweet Servings and My Dream Party. 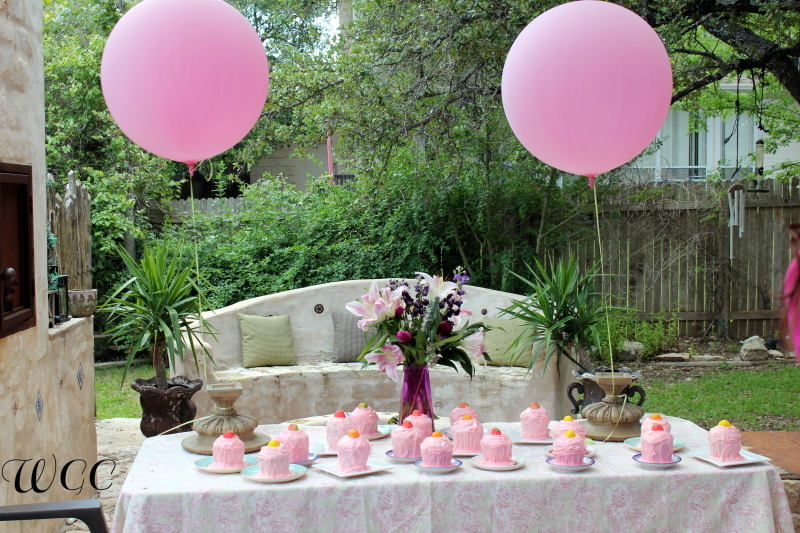 She has been designing beautiful and amazing parties since 1999. With a custom design and theme, how can anyone go wrong? She can make your party one that everyone will remember. 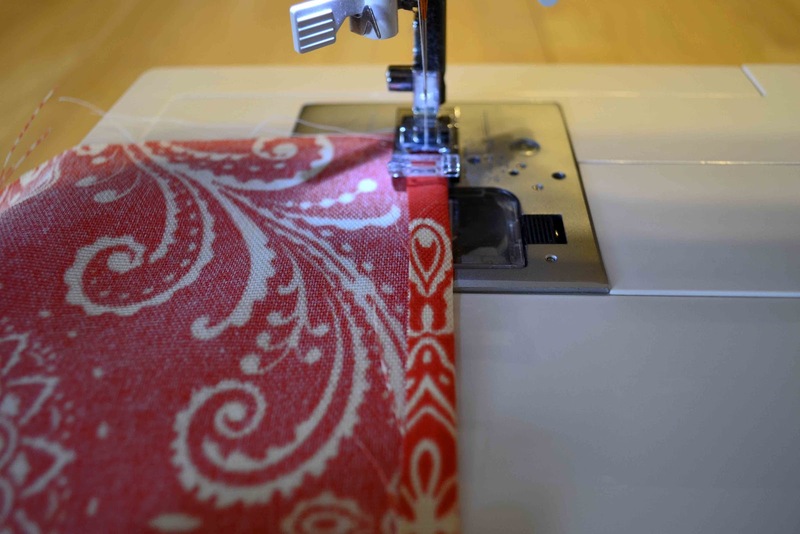 She is known for paying attention to details and creates beautiful masterpieces! How about a S'More Station? Take a look at that presentation! 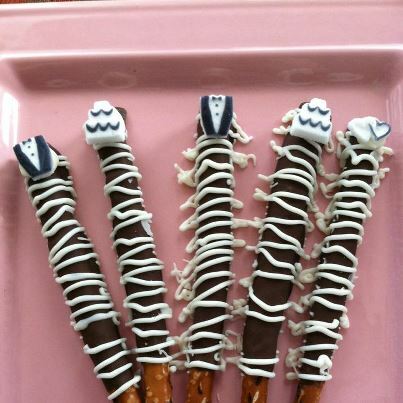 And she also does the chocolate covered pretzels. Is your mouth watering yet? I know mine is! Take a minute to enter the giveaway and you could have some yummy pretzels mailed right to you! This giveaway is open only to the US due to shipping. Thanks! We have been missing in action for a few days. We all have been having so much fun at the Bear Reunion. Our Mom's maiden name is Bear. Isn't that such a fun name! Grandma and Grandpa Bear host the reunion every year in June and we all look forward to it! We drove to their cabin in Lakeside, AZ. The weather was perfect and the company was even better. The kids spent most of the time on the lake. The cabin is on a small peninsula on Rainbow Lake. Grandpa Bear made a small beach near the dock. We also had fun playing beach volleyball, softball, participating in Ping Pong tournaments and eating lots of yummy food. We put together a small orchestra to play for our Sunday Meeting. It was so much fun! We had adults and children playing. Our mom was the conductor. We had 13 people playing: 2 cellos, 3 violas and 8 violins. It was really a neat experience! We played Love One Another arranged by Larry Beebe. One big announcement: Brittany announced the she is pregnant! She is 20 weeks along! So now we have Brooke expecting in August and Brittany in November. A few weeks ago on my way home from picking up my boys from school, I noticed this cute bench and a matching chair on the side of the road a few houses down from mine. I think that I almost came to a screeching stop and put my van into reverse. Now this was probably quite the site to see because I drive a 15 passenger van! Should I keep them white, or paint them a fun color? 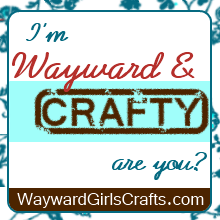 Last week we were given a challenge by the Wayward Girls' Crafts. They give us one word and see what we come up with. The word they gave us was: Popsicle. They also did a spotlight on their blog that you can go and check out here. So I thought and thought about what kind of craft I could make that went along with the theme. We made all kinds of pudding pops. My husband's favorite was banana. My daughter loved the chocolate. 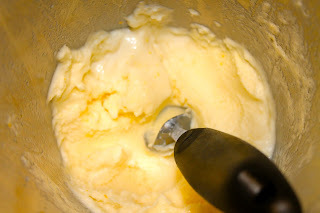 And my boys loved the vanilla. But I didn't want to go with the traditional "popsicle". So I decided to make a shirt. I didn't have time to go to the store to pick up a shirt and taking all my kids with me didn't sound like a fun trip, so I decided to sew one. I picked up some grey jersey fabric on clearance months ago. I knew that it would come in handy one day...and this was that day! I took one of my daughter's shirts that fit her good and used it as a pattern. 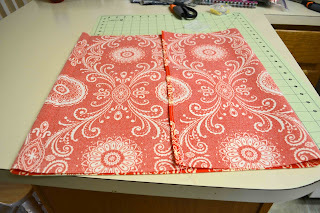 I cut out a front (the one on the right) and a back (the one on the left. 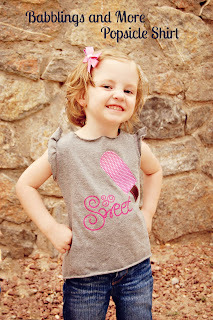 Once I sewed the shirt, I made sure that it fit and then moved onto the fun stuff! 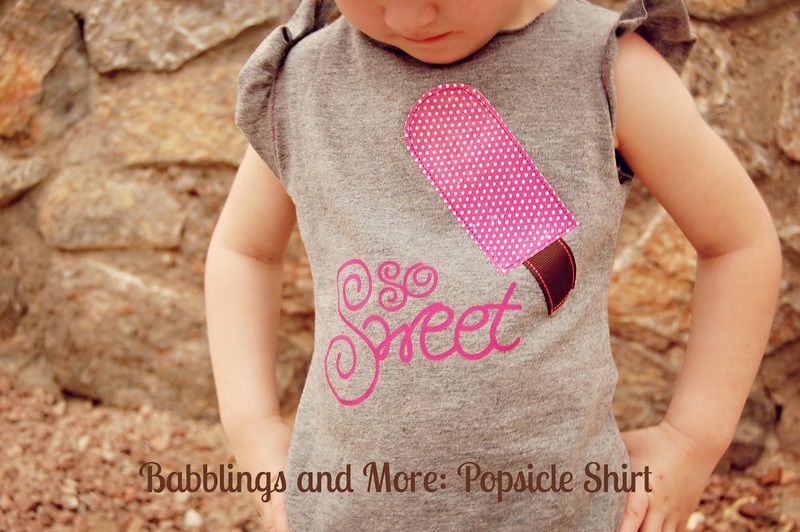 My daughter absolutely loves her Popsicle shirt and I love the price! We all have an amazing father! He is so giving. He is the kind of person that would give you the shirt off his back if he knew that you needed one. He is such a hard worker. Dad is a Blacksmith. You don't see very many Blacksmiths now a days. But he is one of them. He uses the anvil and forge and makes beautiful items out of iron. If you can dream it up, he will create it. It's absolutely amazing! 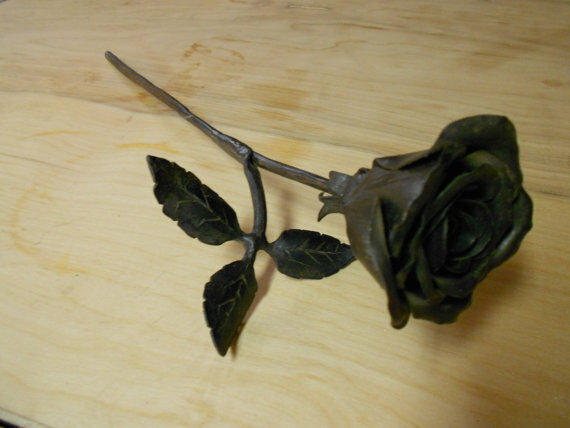 He can even make roses and irises out of metal! One of the roses that he has made. I remember as a little girl watching Dad draw things. I don't know how often he does it now, but I would be so amazed by how he could just draw things. I would get a paper and pencil and try to sketch things the way he did, hoping that someday I could do it like he did. He is a Jack of all Trades. He has done so many things! 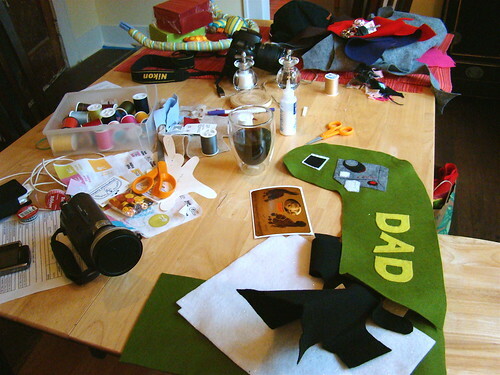 As a child, I just knew my Dad could do it all, and as an adult, I think the same thing! He used to build cabinets, own a Carpet Cleaning business (that I just knew that I would take over one day! ), was a Police Officer, a Rancher, sold Real Estate, had a Pop Machine business, and of course, the Blacksmith! I remember that I used to love going to the Horse Auction with him. I would sit in the stand and admire all of the horses that they would bring through. Hoping that I could take one, or two, or more home with me. In fact, there was one time that I started bidding on a horse and Dad didn't know until the auctioneer started pointed his way repeatedly. Luckily for Dad, someone else was the highest bidder. One of our fondest memories is the Gummi Worms. My sisters will know exactly what I am talking about. We had a little section of field that just got tilled up and had big dirt clods. He bought a package of gummi worms and hid worms under all these dirt clods. Then he ran inside and told us that he found something outside! We were so excited to hunt for all the Gummi Worms! One year for Christmas, Dad searched high and low and bought everyone violins for Christmas. This was in the days before internet, so it was a lot more challenging to locate the instruments. Two of us older girls already played, but the rest of the five kids didn't. 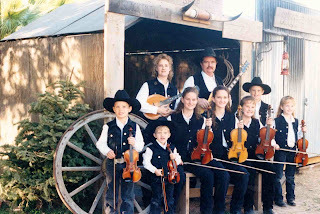 That Christmas vacation, we taught the rest of the kids one song and went and performed it at a Old Time Fiddle Jam in Arizona. People couldn't believe their eyes when they saw seven children ages 14 to 2 walk in holding fiddles. We may not have played the best, but it sure was fun and it was the start of the Reed Family Fiddlers! We later included drums, more guitars, a bass, mandolin and singing. We have played all over the state of Arizona and into various other states! His faith is so important to him. 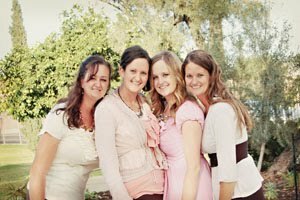 We were raised members of The Church of Jesus Christ of Latter-day Saints, otherwise known as Mormons. I have loved how I could always rely on his testimony. And I knew that everyday he prayed for me and still does. He faithfully went to Church every Sunday, even if it was in his Police uniform! One thing Dad wanted us to learn before we got our Drivers License was to learn how to drive a standard transmission, change a tire and change the oil. Not very many young girls, or even boys, know how to do that kind of stuff! I'm so glad that he taught us how to do that! The truck that we drove was a 1950 one ton Chevy flatbed dually. We sure got a lot of looks, but it was fun to drive! It even had the starter on the floor! And with no A/C, it sure got hot in the Arizona summers! Now people get their pictures taken in front of that old truck! It's funny walking inside someone's house and seeing the truck I drove to high school with their family surrounding it! We all love our Dad very much! And we are glad for the way we were raised! I have to be really organized with my time, but who doesn't? Women are very busy all of the time! For those of you who are just tuning in, I have seven kids. I had five boys first and then two girls at the end. I give Piano Lessons to all of my boys, ages 12 to 6. And I give violin and viola lessons to three of the boys as well. (I take one of my boys somewhere for Cello lessons.) Plus I have other students as well that I teach Piano to. As you can imagine, I have to keep track of lessons and practicing and make sure that no one gets missed. I also use this to make sure every boy gets the lessons that need. And I include any additional lessons that I give, plus any extra activities. I used to write this all of my calendar, but not anymore because I have too many names to include. We recently got nominated for the Sunshine Award be Create.Craft.Love. Thank you SO much! If you have never been over to Jill's blog, you definitely need to head over there and give it a visit. She is full of adorable ideas and her blog is SUPER cute! We LOVE her! Thank you Jill for nominating us! The Sunshine Award is given by bloggers to bloggers. 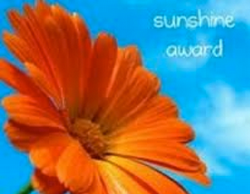 The recipients of the Sunshine Award are "Bloggers who positively and creatively inspire others in the blogosphere." Bridget- Turquoise, I love natural colors. Brooke- Pink, I just think it is really pretty! Briana- Rabbits, I used to raise them when I was a kid to earn money. Brittany- Horse, I would rather ride than walk. Bridget- Dog, they don't talk back and they are always happy to see you. Brooke- Baby Bunnies, they are so soft and cuddly! Briana- 16, that's when I got my driver's license. Brittany- 7, that is how many is in my family. Bridget- 19, that is the day I had my first child. Brooke- 13, that is the day I was born. It is lucky to me! Briana- Water, it's my "go-to" drink! Brittany- A&W Root Beer, the best root beer EVER. Bridget- Cherry Limeade, It is so refreshing in the Arizona summer. Brooke- Pero, I love getting a hot glass of pero and reading on the porch before my children get up! Briana- Facebook, I don't know much about Twitter yet. Brittany- Neither, it is a big waste of time. Bridget- Facebook, Twitter is dumb. Brooke- Facebook, I am not familiar enough with Twitter. Good Book or a Good Movie? Brittany- Good Movie, so I can fall asleep. Bridget- Good Movie, I am a movieaholic. Brooke- Good Movie, with my two toddlers at home, I really don't have the time or patience to read a good book. Briana- Music, I love teaching and listening to my children practice. Brittany- Eating, I LOVE food! Brooke- Fiddling, I absolutely love entertaining people and making them happy through music. You get to see all sorts of emotions from dancing to crying. Briana- Giving, I love watching the surprise on their faces when they open them! Bridget- Giving, I am not very good on the receiving end. I like finding creative presents! Brooke- Giving, especially to my two children. I LOVE seeing the excitement on their faces! Briana- Whatever day my husband has off, it's different every week. Brittany- Fridays because it is the start of the weekend. Bridget- Saturday, I get to go yard selling and spend time with my family. Brooke- I absolutely LOVE Sundays. We get to go to church to be uplifted and it is the only day where my husband is home! Briana- I love all flowers! Brittany- Sweet Peas, they just smell SO good and they are pretty. Bridget- Sunflower or Daffodil- one comes in the spring and one in summer. Congratulations everyone! I am looking forward to getting to know you all a little better! Thank you again Jill for nominating us! 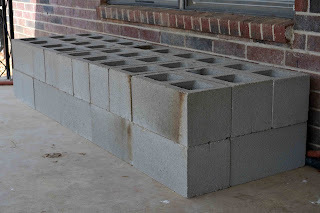 After finishing our Cinder Block Sandbox I still had TONS of cinder blocks left over. 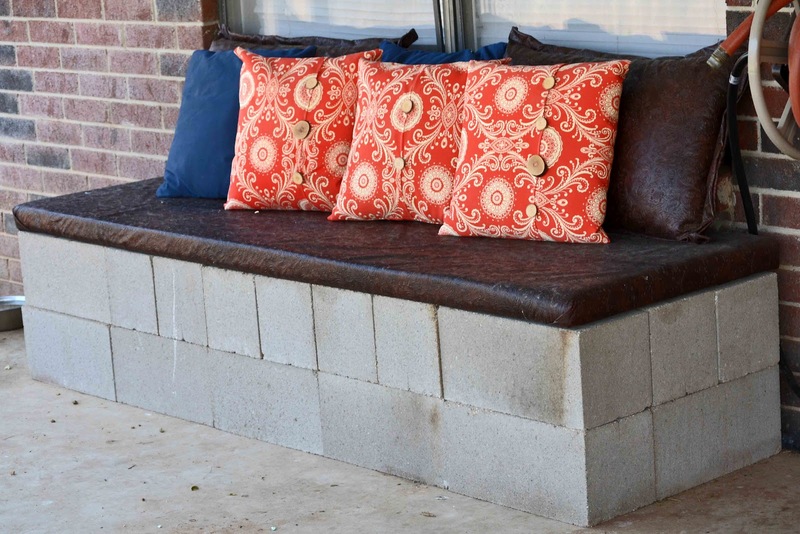 I wanted to make something that was usable, so I decided to make a Cinder Block Bench for our back porch. It was super easy and super cheap (since I already had all of the Cinder Blocks). 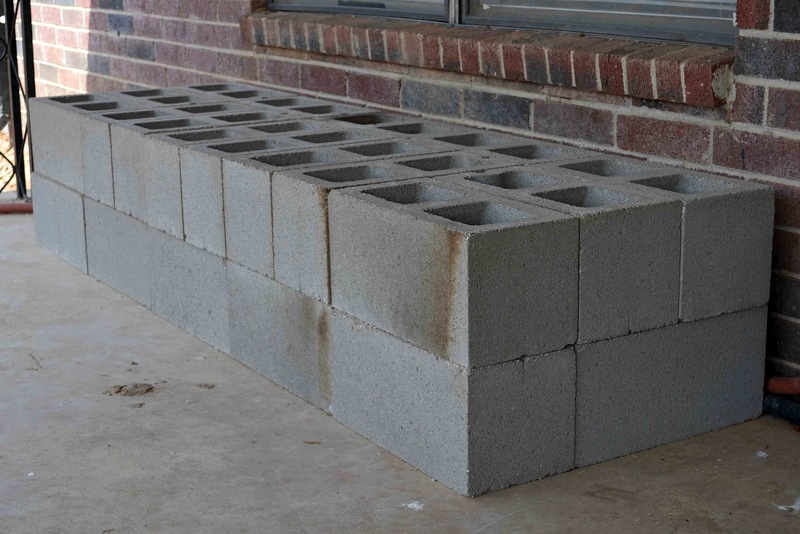 I stacked the cinder blocks where I wanted them. I used 1 1/2 x 5 cinder blocks to make the base. I wanted some cushion for the seat. So I went to JoAnn's and picked up some 2 inch foam and I picked up some vinyl at Hobby Lobby. I used the same vinyl that I redid my Step Stool Chairs in. 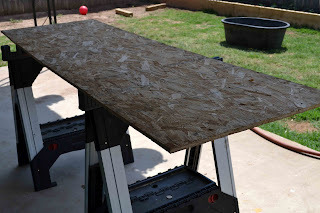 I also used some old plywood that we had around the house. 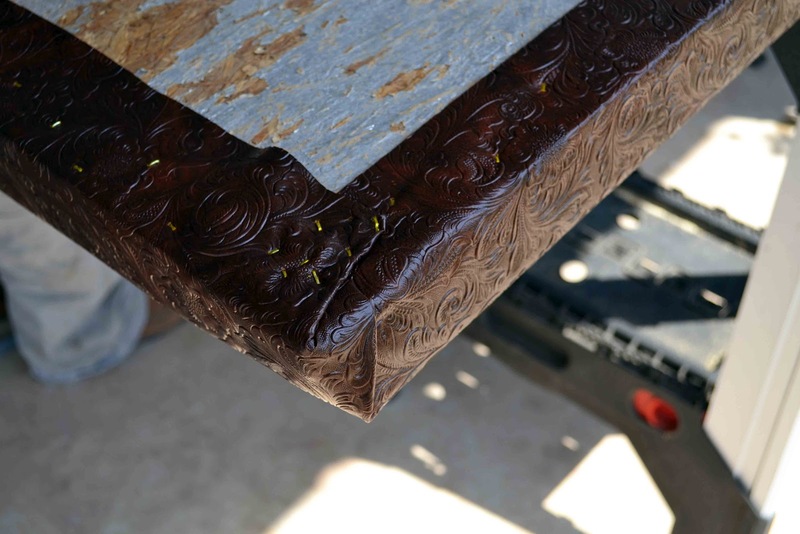 To make the cushion you first cute the plywood down to the size you want. You then put the Foam on top and the Vinyl on top of the foam. Then you just staple everything to the plywood. I did the corners last just to make sure they looked the same and looked neat. The cushion fits perfectly on the cinder blocks. For the cushions I made covers for 2 king size pillows and several 17x17 accent pillows. 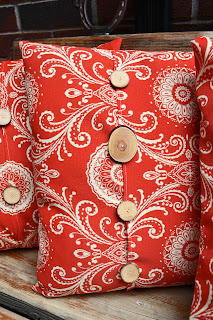 You can find the tutorial for the pillows HERE. I really liked how the bench turned out. 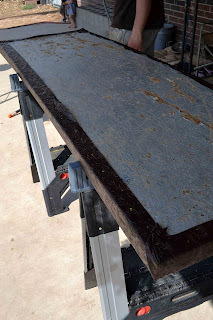 It is actually really comfortable and is really nice not have those cinder blocks stacked up where my kids can get hurt! We all have to go grocery shopping every once in a while, but what does one do with all those extra bags? Some people just throw them away, some people have cute ways to organize them and some people bring their own bags to the store. Well, I admit that I've thrown too many of these bags away and then we I need a bag, I don't have them. Now, I won't have to worry about that any more! 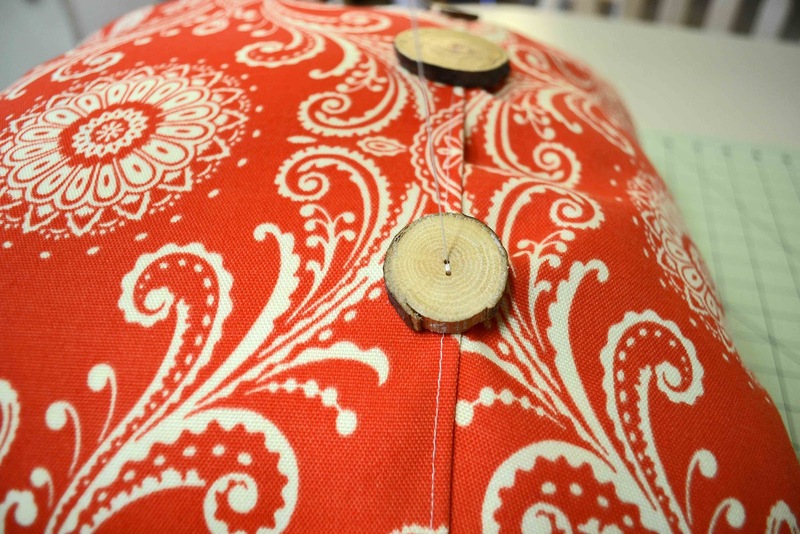 I will always have these bags in stock and I have a super cute way to store them! It is a CapriSun box! They have redone they way the package their juice boxes and they are perfect for storing bags! With some cute paper and mod podge, you can turn this box into a trendy organizing tool! What do you use to store your grocery bags? 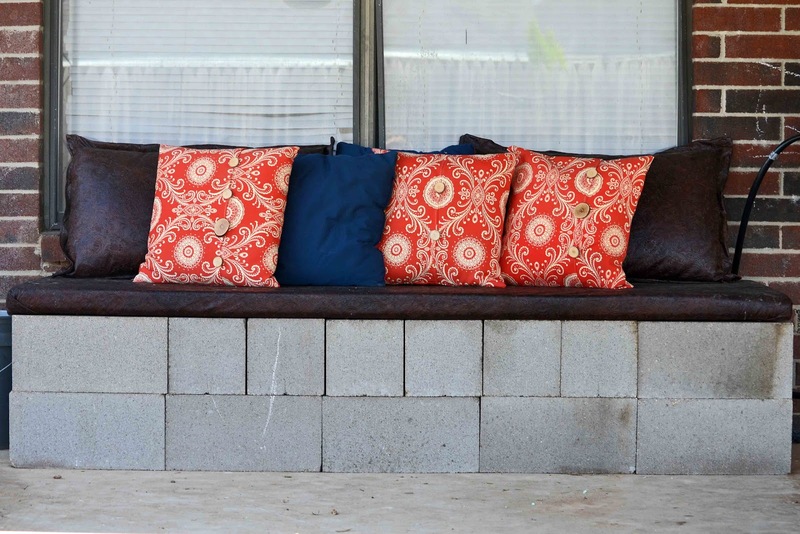 I LOVE outdoor pillows! They add a lot to any outdoor space. The problem is that they are so expensive. 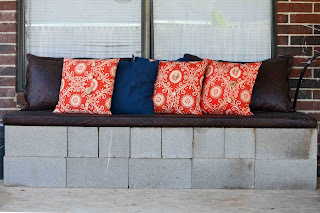 I decided to make my own Outdoor Pillow Slipcovers. 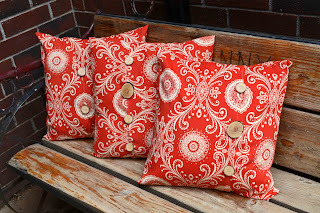 I am telling you- they are SO easy that you will go crazy making all sorts of outdoor pillows! I used Outdoor Canvas that I bought at Joann's for the fabric. Joann's actually has a pretty large selection of Outdoor Material. When I saw this orange fabric, I couldn't resist it! 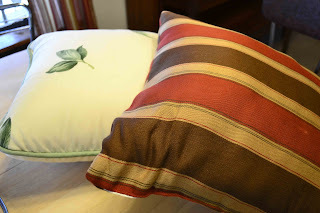 I did not want to spend a lot of money on these pillows, so I went to Goodwill and picked up some pillows that were in good shape. They were $1-2 a piece. 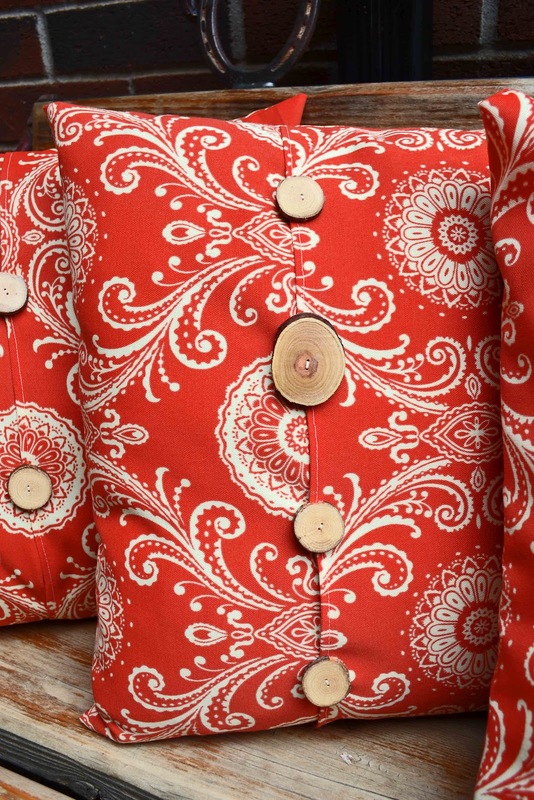 These pillows are all about 17in x 17in . I bought one yard of fabric- one yard made 3 pillow covers. 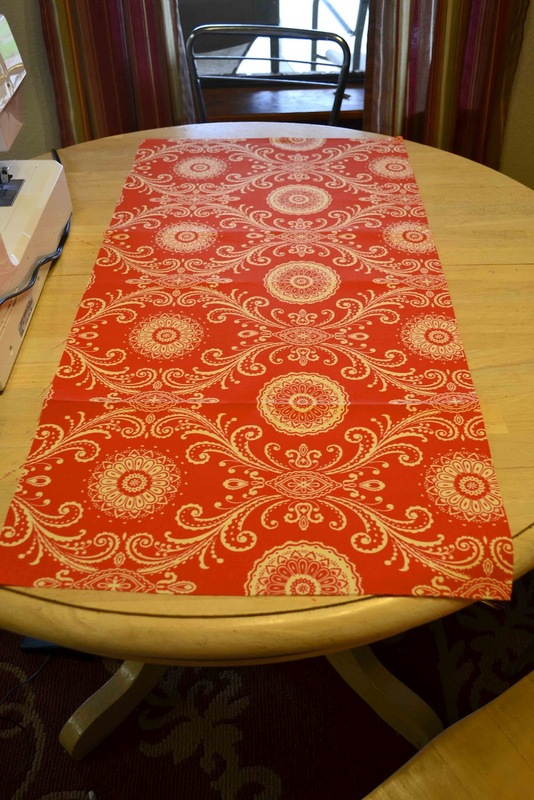 I cut the material at 18 in x 36 in. You hem both of the 18 inch sides. 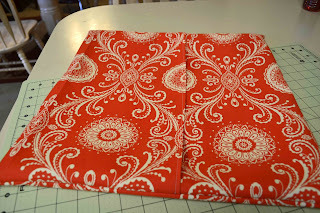 Next, I laid out the material so the sides are over laping about 1 inch and pinned it on both sides. Make sure the right sides are together. 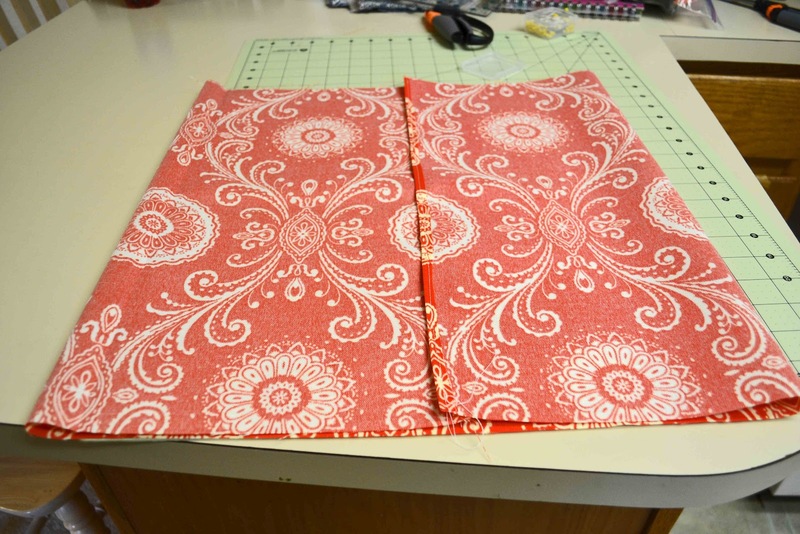 I then stitched up both of the sides and turned the material out. 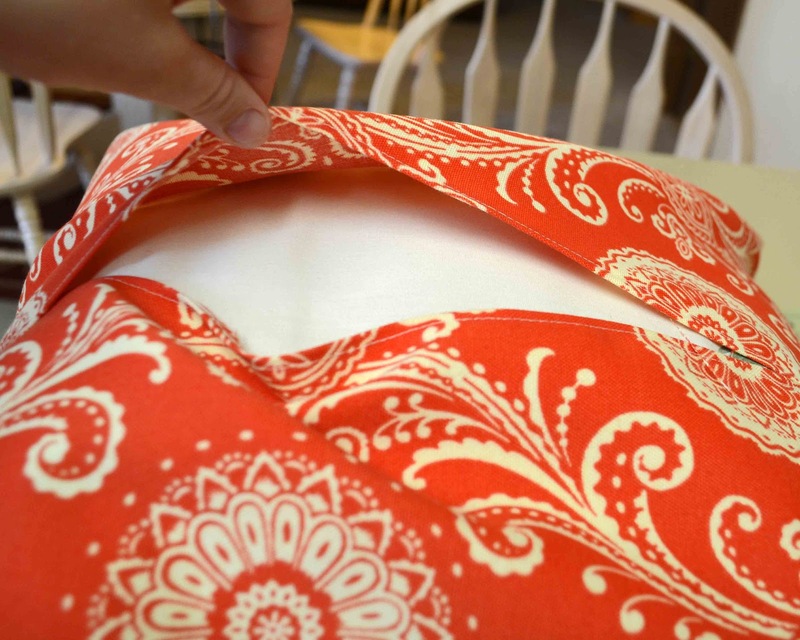 Now, I stuffed the pillow in the cover. You can leave the pillow just like this, but I wanted a little extra feature. So I stitched on some wooden buttons that I won from a giveaway a while ago. 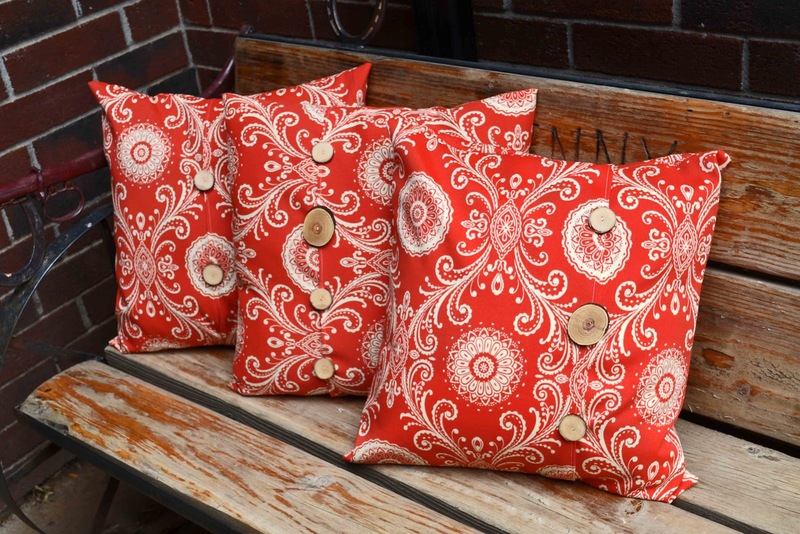 These pillows cost me about $4 per pillow (the outdoor canvas is more expensive than regular material).